Ankit Satsangi from Pune, B.Com Graduate. CORPORATE LAW COMPAN.. COMPANIES ACT 2013 M.. FINANACE & ACCOUNTS TALLY 9.0 ERP MS E..
are one of expert skill area's of Ankit Satsangi . 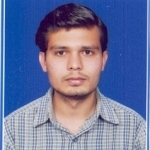 Ankit Satsangi is working in Legal/Law industry.